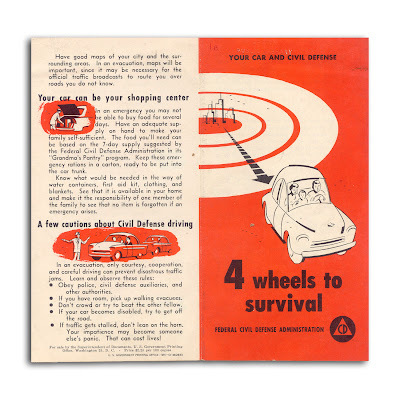 Government information pamphlet on using your car for escape and protection in a nuclear attack. Copyright 1955. 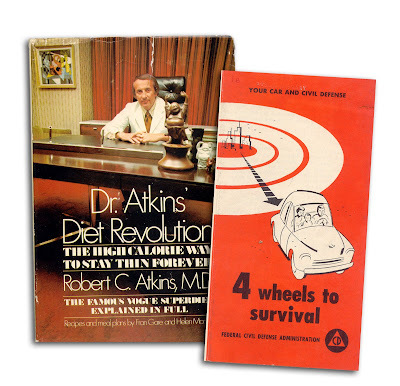 Found in "Dr. Atkins Diet Revolution" by Robert C. Atkins M.D., published by McKay, 1972. 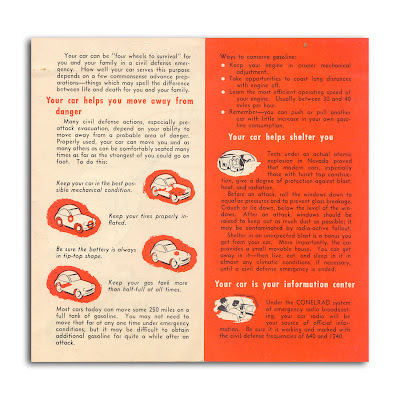 ED: From the pamphlet: "If you have room, pick up walking evacuees," "Remember - you can push or pull another car with little increase in your own gasoline consumption," "Tests under an actual atomic explosion in Nevada proved that modern cars... ...give a degree of protection against a blast, heat and radiation." It was a simpler time, wasn't it? good god. I want that pamphlet! in that scary 80s miniseries movie, "the day after" (I think it's called), the guy's car engine dies right before the bomb blast - something to do with the crazy electromagnetic field I think? he's like, "WTF? why are all of these cars dead? ", and then everyone gets blasted and you can see their skeletons a la some sweet 80s cinematography. scary.